Happy Birthday to the furthermost Resort of Maldives : Shangri-La’s Villingili ! As you might know, today, July 26th 2010, is a very special date for Maldives as the country will celebrate 45th years of independance from the British. But did you know that July 26th was also Shangri-La’s Villingili very first Birthday ? And eventually…do you know Shangri-La’s Villingili ? Apart from its birthday, the young resort deserves a special focus on Dreaming of Maldives…. Located in the very far and unspoiled most southern Atoll of Addu, Villingili is the furthermost resort of the Maldives ! It is simply and beautifully, the latest point of the Territory. Go further, and there will be nothing else than the vast Indian Ocean…. To reach Villingili, you will have to fly with Maldivian, the National Maldivian Airline Company and cross the Equator. After 1h10 minutes of probably one of the most amazing flight above the archipelago, you will land to Gan International Airport, second Airport after Male/Hulhule airport. The transfer to Shangri-La’s will only take you 10 minutes by speed-boat. The first impression of the island is unforgettable…Villingili is just majestic. Impressive first by its size : 2 kilometers long ! (an exception in Maldives where the average resort length is about 500 meters) and then… the vegetation : ….17 000 very high coconut trees and gigantic Banyan Trees, surrounded by a bright blond very long sandy beach and an endless perfectly shaped turquoise lagoon…The “waow” effect is guaranteed, even for the long time traveller in Maldives. Besides its stunning location, Shangri-La’s Villingili Resort and Spa, first luxury resort in the Maldives south of the equator, is located in a boutique-style environment where guests can choose from private ocean retreats to tropical tree house villas with panoramic views, a selection of fine dining options, innovative treatments at CHI, The Spa and cycling on nearby islands will satisfy every sense. The Hong Kong-based Shangri-La Hotels and Resorts, famous for its touch of elegance and luxury transformed Villingili into a true Luxury retreat in a very well preserved and astonishing natural environment. Happy Birthday Shangri-La’s Villingili, and many others to come ! Addu Atoll is not like the Maldives as we all know them. Of course, you will find the usual beautiful landscapes, as in the rest of the country, but the Atoll has something different, something more…Everything looks bigger, thicker. The islands, the vegetation, the lagoons…even the air you breathe will not be the same…The southern Equatorial position is the key factor to this rare and subtile differences. Furthermore, the Atoll is located at 336 miles away from Male…obviously Nature can not be the same. Long-time home base of the British Militaries during their colony, Addu Atoll is also the birth place of most of the resort Staff you will meet around all Maldives, as their English language level used to be the best and highest in the country. The people from Addu were the first to work in the Hotel and Tourism industry in the Maldives, in the 70’s. 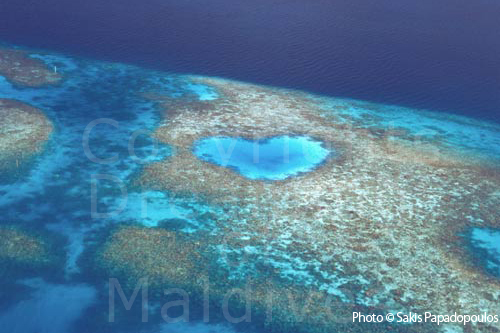 In exclusivity for you, a unique aerial photo of a Heart-Shaped reef in one Atoll of Maldives. Undoubtedly, flying above Maldives is an incomparable experience. There is no better way to observe the infinite mosaic of islands and reefs spreading along the 90000 km 2 ( 35 000 sq mi) of this fabulous archipelago. In Maldives, aerial views are truly breathtaking. From the sky, islands and reefs look like tiny green and ivory spots, surrounded by turquoise waters and gracefully lying on the deep blue color of the sea. Even from the sky, lagoons are so transparent that we can, sometimes, observe groups of fishes swimming around in their labyrinths of corals. Formed over hundreds of thousands of years on volcanoes’ sinking remains, the 26 atolls of Maldives will surely astonish you, not only by their indisputable beauty, but also by their aspect and variety of shapes. Their splendor, even after several flights above the archipelago, will always surprise you and never make you lose your enthusiasm. 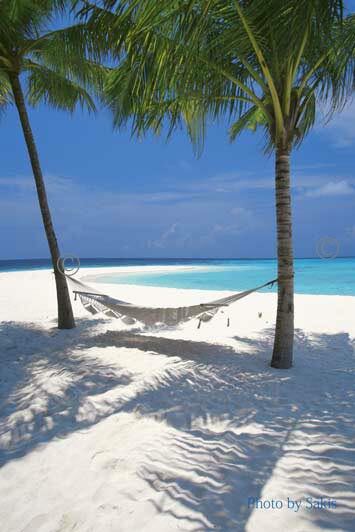 In Maldives, in her quest for Perfection, Nature drew fabulously shaped islands and reefs. This unique photo of a small heart-shaped coral reef, spotted during one of our photoflights, is again another testimony of Maldives beauty. 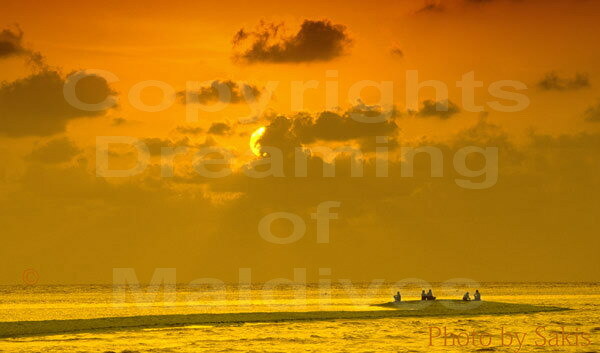 ALL RIGHTS RESERVED © Dreaming of Maldives 2005-2010. Sunset on a Sandbank in Maldives. It is 06.00 pm in Maldives. Sometimes, the time for reflection too. At this time of the day, all Maldives resorts – 3, 4, and 5 stars – live at the same rhythm, in the same smooth, romantic and tranquil atmosphere. At this time, all Holiday makers of the islands stop their activities to stare at the horizon. At 06.00 pm, at the equator, the light becomes so particular, so remarkable and so amazing, that such moment can not be missed. It is time for the long-awaited Sunset. It is the time when, close to the beach, terraces at the resort cafes are mostly crowded. Some resorts have a special music program adapted to the magic of the moment. Others will let the moment as it is… In silence. If you stay in a resort provided with a sandbank, you will definitively have to get there at this time. And be sure not to forget your favorite drink ! You will often find yourself alone or in a tiny group, as the sandbank relative “distance” – a few hundreds of meters – together with the nonchalance of the islands often dissuade most of the people from going there. No sandbank in your resort ? Well, do not worry, magic and tranquility are still guaranteed. In Maldives, even during the highest season, you will always find a hidden and desert piece of beach, at any time of the day. The perfect combination of the resorts sweet Rhythm of Life and clever infrastructures is the best to create idyllic hideaways.